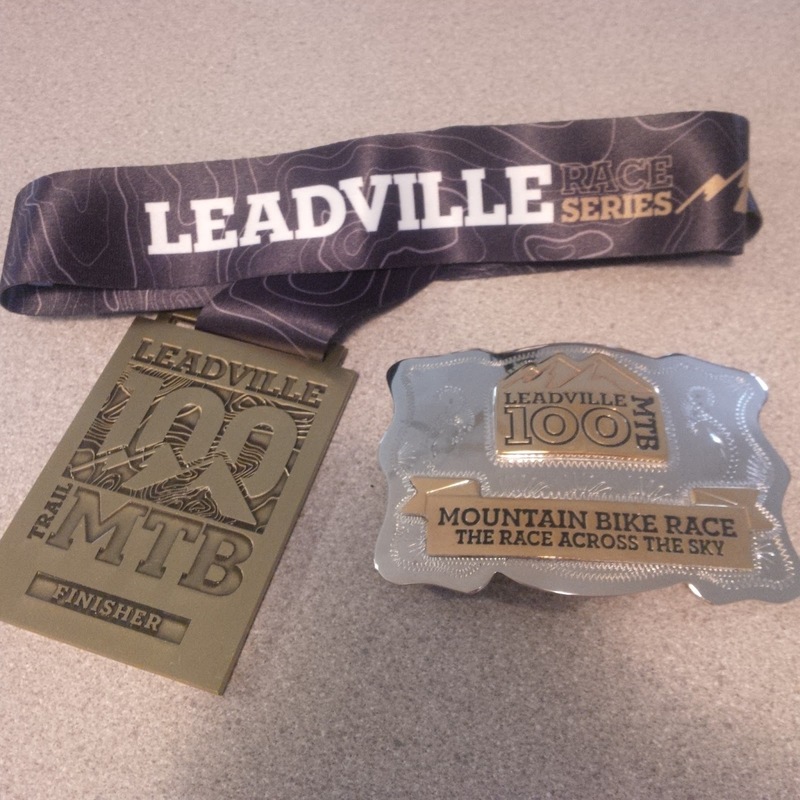 The Leadville 100 mountain bike race has been on my bucket list for over a decade. I tried gaining entry via the traditional race lottery for several years, with no luck. So last year I decided to enter the Leadville, Colorado "Silver Rush 50" qualifying race, where doing well enough would earn me a starting spot at the big one. 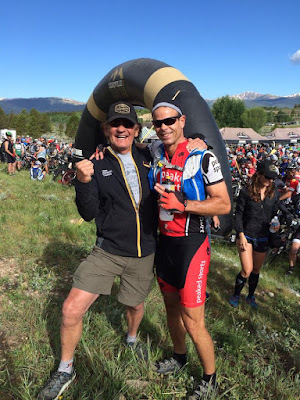 It worked out great - the Silver Rush itself was an awesome event, I got to meet founder Ken Chlouber...and I earned my starting spot at this year's iconic Leadville 100 Mtb race. It finally happened on August 15...11 days before my 50th birthday. 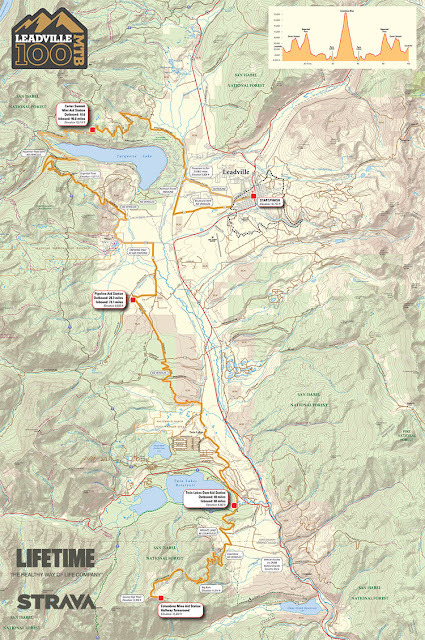 The race is actually 104 miles total, with over 11,000 feet of cumulative climbing on a combination of dirt roads, doubletrack, singletrack, and a bit of pavement. 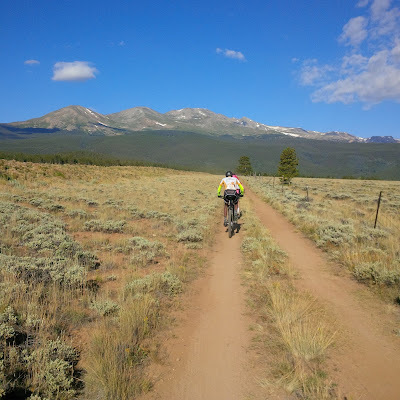 It's an out-and-back format, from downtown Leadville (elevation 10,200 feet), up & over a couple of formidable mountain passes, and then a huge climb up Columbine mountain to the turnaround at mile 52 - which sits at 12,600 feet above sea level and feels like you're riding on top of the world. I've been pedaling a mountain bike for nearly three decades, and racing for the past ten years or so. I love the adventures that come with it - being out in the woods, the wildlife encounters, fishing access, views, exploration, camaraderie, and fun. 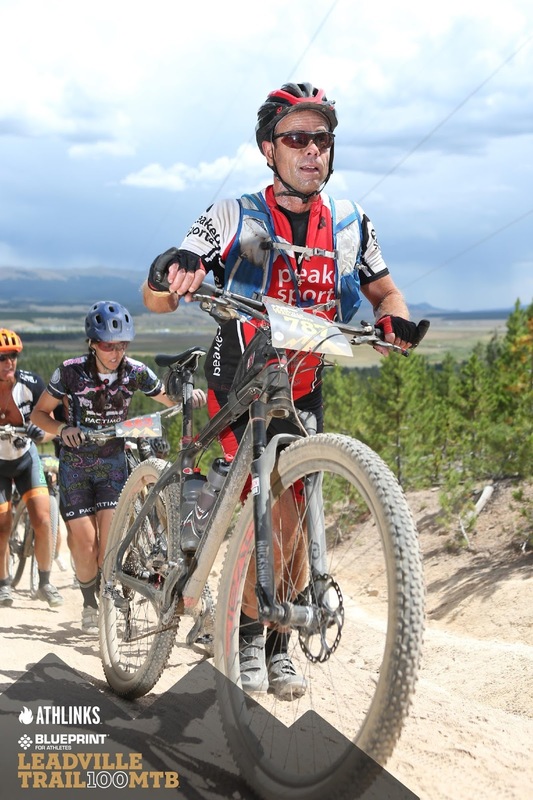 I tend to do better in shorter races, but Leadville is arguably the world's most prestigious mountain bike race...and hence it has been on my radar. If you've seen Race Across The Sky, you understand. 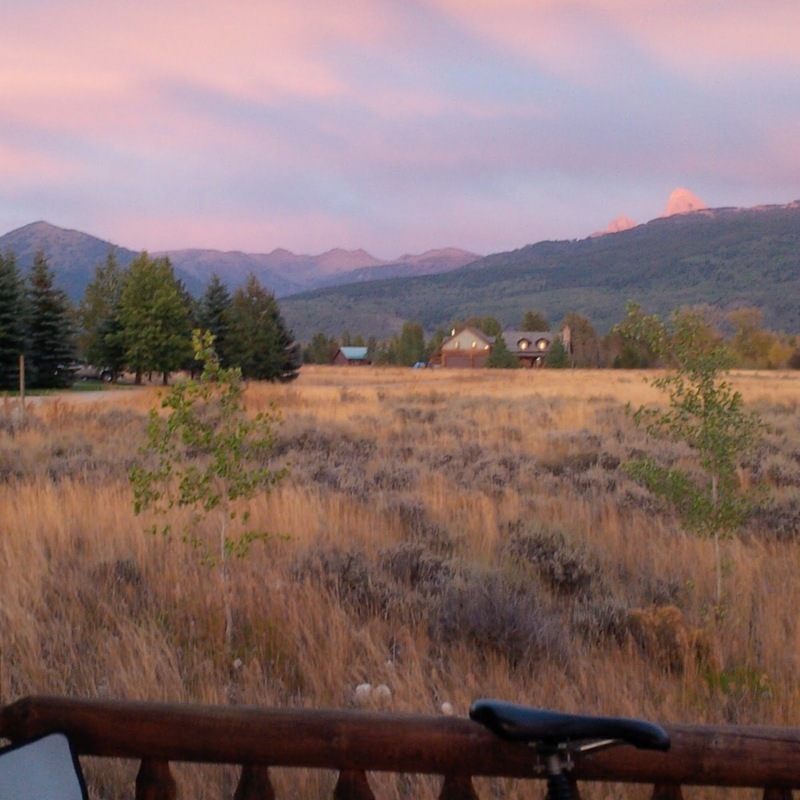 I decided to make it even more challenging by crashing hard on my final training ride before leaving Driggs. My car was literally packed, and I went out for a lunch spin before making the drive to Leadville...and bam, down I went on some loose gravel on a downhill corner. I hadn't crashed in almost 10 years, but I guess it was time - and the result was a huge contusion on my right hip, ankle & elbow. So I broke out the ice, hobbled into the car, hit the road via Rock Springs, Steamboat Springs & Minturn, and tried not to think about the pain or the fact that I could now barely walk. 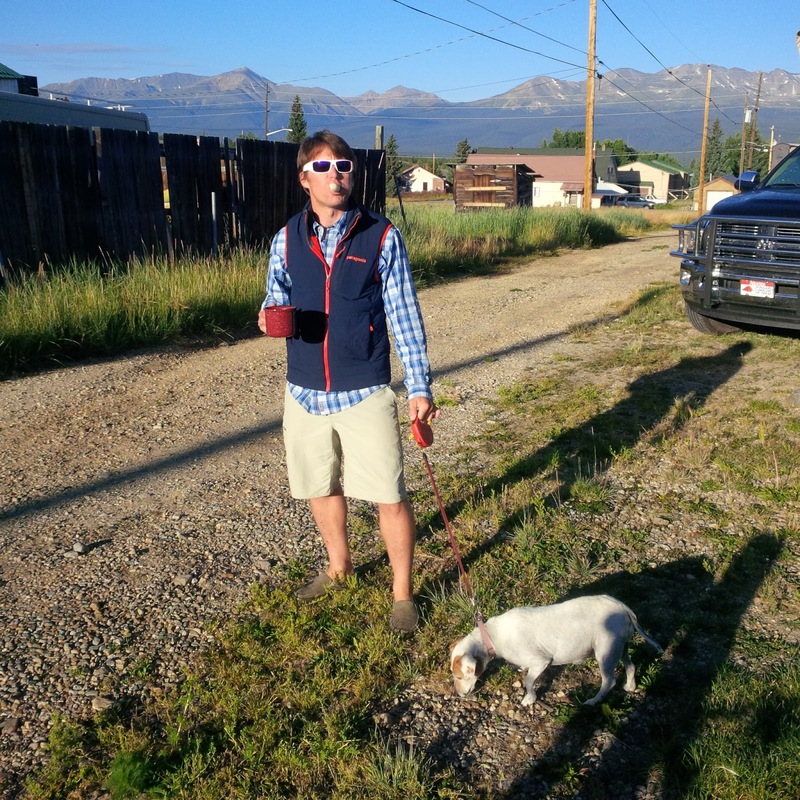 Once in Leadville, the scenery and pre-race energy quickly got me focused on the task at hand. 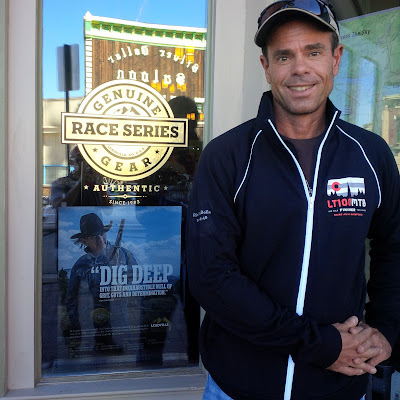 My buddy PNut from Tucson met me in town, and provided fantastic race support. 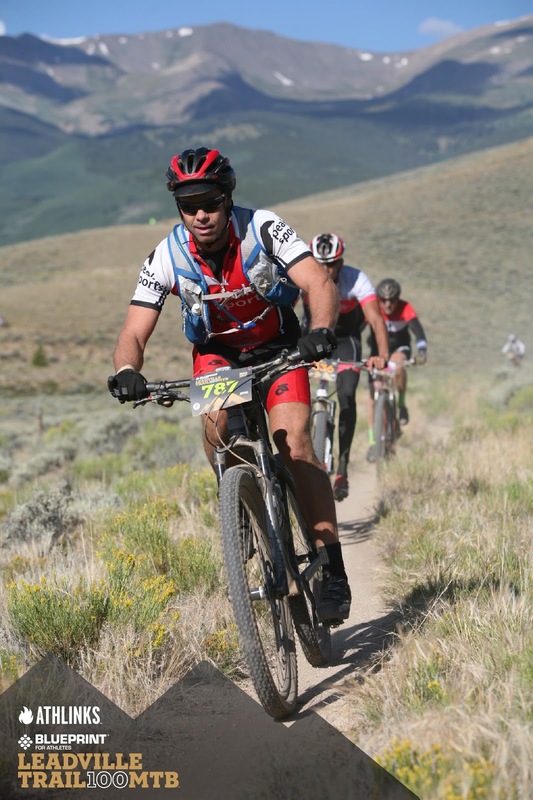 He's a professional mountain bike guide & instructor with non-stop energy, which I needed. At the mandatory pre-race meeting on Friday, professional racer Rebecca Rusch spoke about the importance of defining the "purpose" of your race, because that is what will carry you through the inevitable low points you'll encounter. I decided mine would be a celebration of the sport I love so much: the places it has taken me over the past 25+ years, the people I've shared rides with, the wildlife & sunsets & breathtaking views, the Driggs/Jackson high school mtb team I'm now helping to coach...and the simple, pure joy the sport brings me; a recognition and culmination, in one. Turns out such purpose was indeed needed on race day. 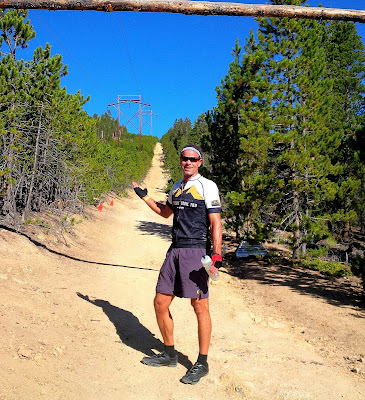 A short pre-ride on Friday helped loosen me up, and gave some perspective of the dreaded Powerline Climb. This comes at mile 80 during the race, and seems to never end (it goes on-and-on, far beyond what you can see in this photo). I can climb pretty darn well, but realized here that I would be pushing my bike up most of this section the next day. The pre-ride also revealed that my rear derailleur was bent from the crash I took a couple of days earlier. So, PNut went to work on it at our campsite...and then the awesome Cycles of Life bike shop finished the job. I was all set to go - mechanically, at least. 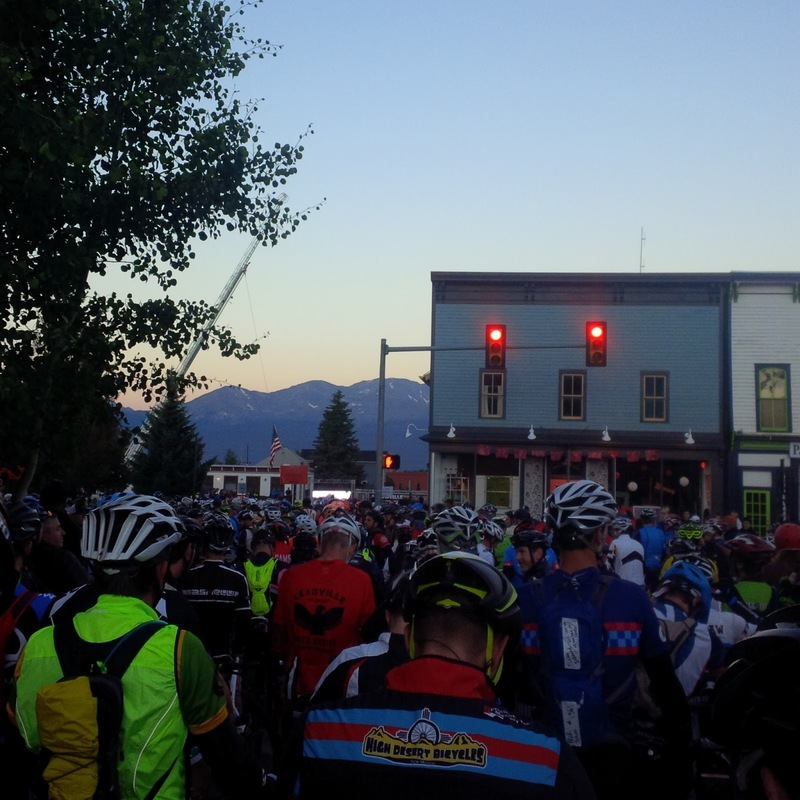 Race start time is 6:30am, and the day dawned clear but cold. Based on my finishing time at last year's qualifying race, I was in the 3rd wave of starters out of 8 total - but there were still several hundred riders ahead of me. 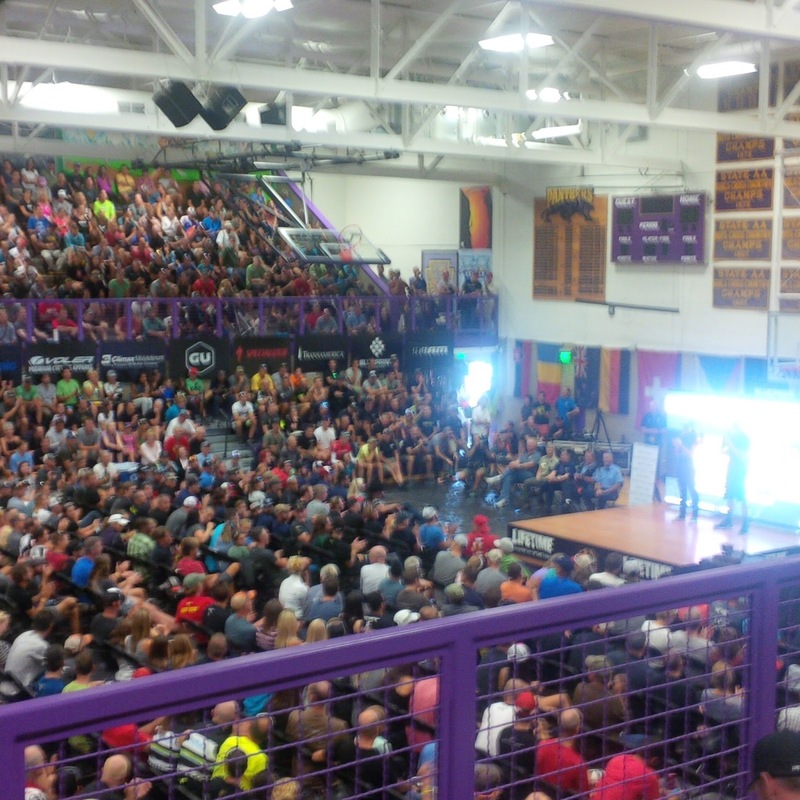 Mountain biking legend Dave Weins' son performed an incredible national anthem, the crowd settled down, and the starting gun sounded. It was a neutral rollout for 3-miles out of town, and then the race began in "hurry up and wait" style. For the first hour or so - mainly the St. Kevins climb - racing consisted of riding patiently behind other riders and then passing people whenever the trail & energy allowed. It was a gorgeous day in the Colorado high country, and I made an effort to simply look around and soak up the experience. This photo is while climbing Sugarloaf at about mile 15, before descending Powerline. I also focused on hydrating and taking in calories, early & regularly. 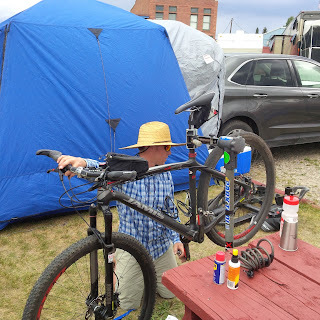 I can bust out hard 2-3 hour rides with nothing more than a water bottle and a couple of gels, but anticipating 10 hours in the saddle I knew I had to fuel properly. 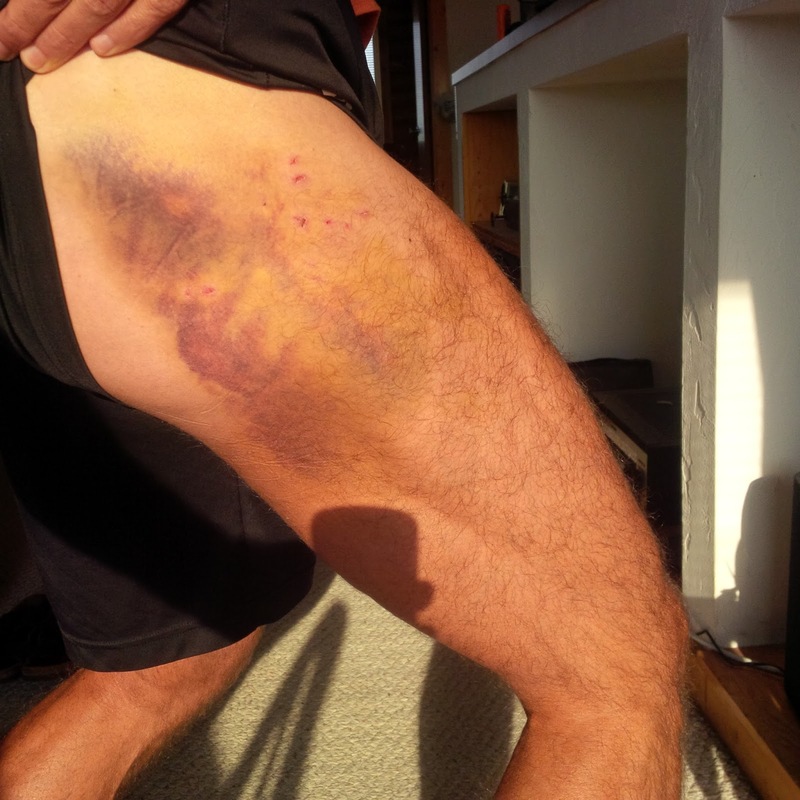 I was also hoping to minimize the inevitable cramping that hits me late in long races. Did I mention how beautiful it was out there? 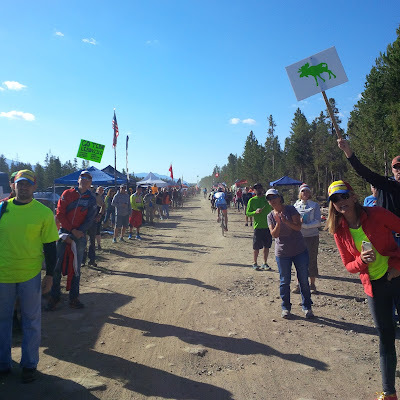 And the aid stations were off the hook, in a good way. Such amazing energy. 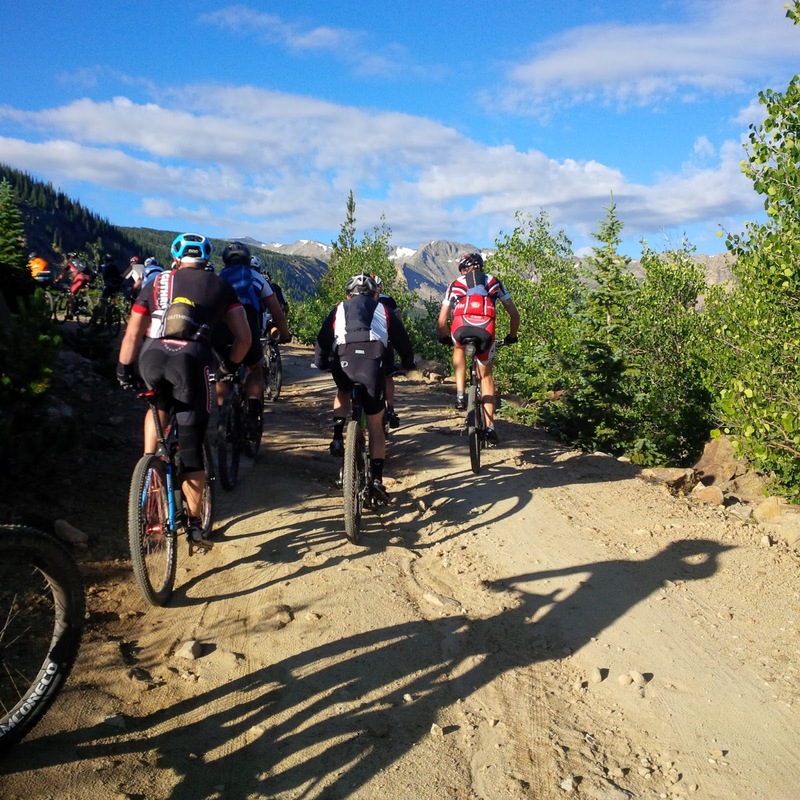 My favorite section of the race was the singletrack, of course. This photo is around mile 35, before the true pain set in. I made it to the Twin Lakes aid station at mile 40 right on my time goal of 3 hours. PNut resupplied me with food & water; and then, around mile 42, the route tilted up - and up - and up. For the last several miles of the 3,000 foot climb up Columbine, we were all pushing while the super-fast race leaders came screaming downhill to our left. It was intense, and I was starting to cramp...uggh. The Columbine aid station, at mile 52: on top of the world - figuratively, anyway. The food was delicious and the volunteers were absolute rockstars. I felt wrecked by the altitude and effort already, but the vibe here imparted hope. 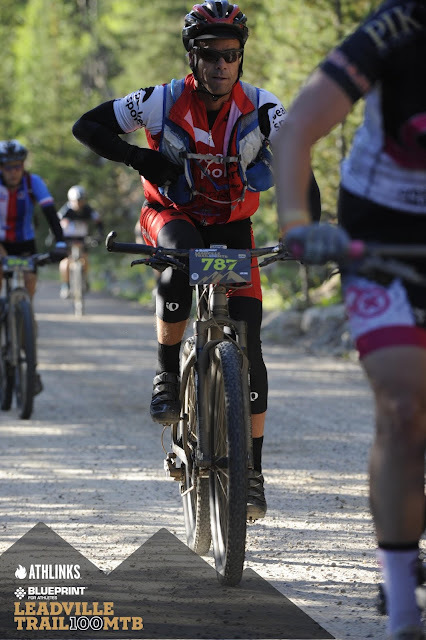 I gave my disc brakes a good workout on the long Columbine descent, refueled again at the mile 63 Twin Lakes aid station (thanks to PNut for being there), and had a surprisingly nice resurgence until mile 80 at the base of Powerline climb. 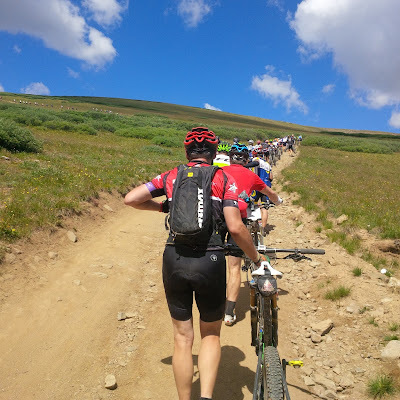 At that point it was obvious I was cooked and the cramping was going to fire up anytime there was extended climbing; we're talking about locking up in every muscle from hips to feet - calves, hamstrings, quadriceps, etc. It had also turned into a hot day by Leadville standards, and I knew the task was now a matter of somehow persevering to the finish at altitudes with very little oxygen for recovering. And yes, my dawggone hip hurt. What keeps people going in situations like this is remarkable & inspiring. 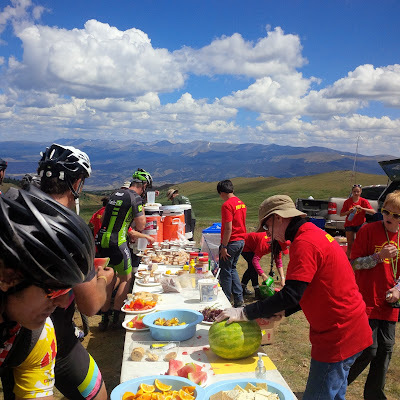 Dozens of riders were stopped along the trail every mile during the climbs - cramping, puking, laying down, moaning, and staring into space. Incredibly, we all paid money for this. For the last 2.5 hours of this reduced form of "racing," I had bursts of power followed by low points in 10-15 minute increments. Remembering why I was here is what kept me going. I kept repeating "I love mountain biking" to myself, and chuckling. It worked. 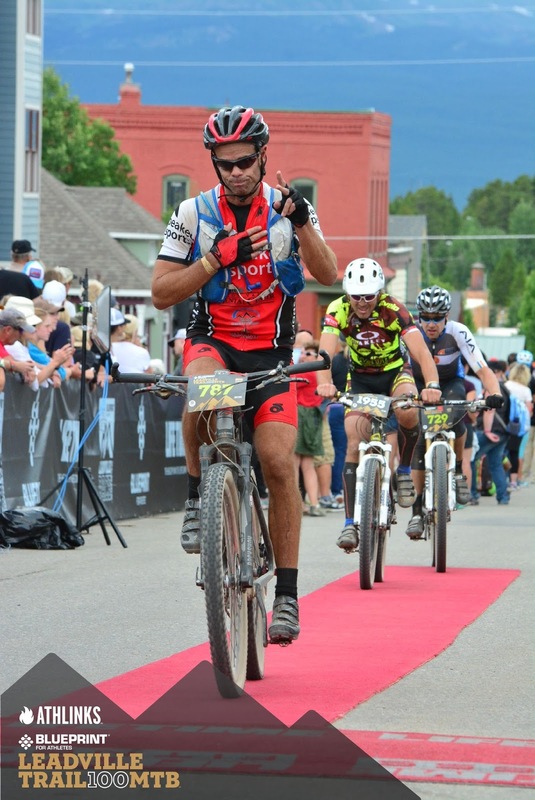 Miles 100 to 104 were brutal, but riding up that red carpet - with hundreds of people ringing cowbells & cheering, and the P.A. announcer reading off names & hometowns...I teared up. My body was dead but my heart was full, and there was a purity to it. The past few years of my life have been full of change, challenge, and sometimes painful self-analysis...but the bike has always been there. A lot of people, places, experiences and dreams led to this moment, and I was deeply thankful for all of it. My official finishing time was 10 hours 34 minutes, which put me almost exactly mid-pack (roughly 1,800 racers had started the day, from all 50 states plus 28 countries, and about 1,400 finished under the 12-hour cutoff time). I usually place higher, but with the exception of LOTOJA this effort was beyond anything else I'd done. I was 5 hours 17 minutes to the halfway Columbine turnaround, and the exact same 5 hours 17 minutes back...pretty crazy. All things considered, I'm proud of the effort - but there will be no rematch. 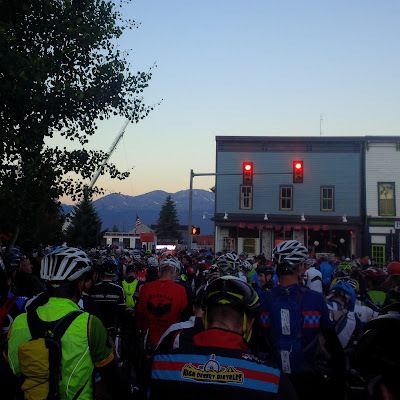 Event founder Ken Chlouber admonishes all racers to "dig deep," a metaphor from the town's Molybdenum mining roots and because that's what it takes to finish. And he's right. I'll wear the official finishers LT 100 Mtb jacket with honor, complete with my name and finishing time printed on the right shoulder. This bucket list item was the toughest yet...but worth every second. The medal and belt buckle are now reminders that "what doesn't kill us makes us stronger." And hopefully wiser. 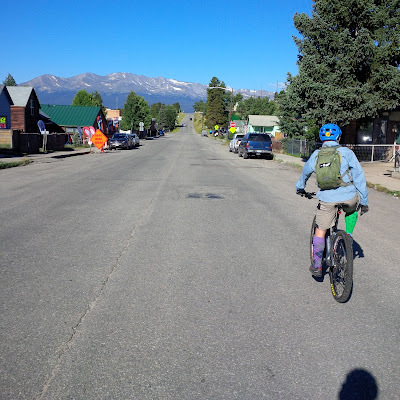 Leadville was awesome - the event, fellow racers, volunteers, scenery, town, tradition, everything - and it gave me an expanded perspective of the sport. Now it's time for some fun fall riding & fishing in the Tetons. You forgot to mention this was just a training ride for the Crusher in the Tushar. Great report brother. You are an inspiration to us all. Love your site. I'm a senior planning on moving to apts in Victor. I'm fairly active and hate big cities! Is this a good place to retire?love any info you might have.